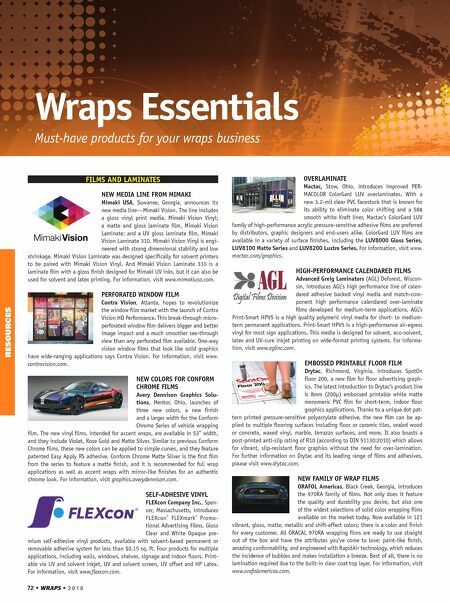 72 • WRAPS • 2 0 1 8 Wraps Essentials Must-have products for your wraps business RESOURCES FILMS AND LAMINATES NEW MEDIA LINE FROM MIMAKI Mimaki USA, Suwanee, Georgia, announces its new media line—Mimaki Vision. The line includes a gloss vinyl print media, Mimaki Vision Vinyl; a matte and gloss laminate film, Mimaki Vision Laminate; and a UV gloss laminate film, Mimaki Vision Laminate 310. Mimaki Vision Vinyl is engi- neered with strong dimensional stability and low shrinkage. Mimaki Vision Laminate was designed specifically for solvent printers to be paired with Mimaki Vision Vinyl. And Mimaki Vision Laminate 310 is a laminate film with a gloss finish designed for Mimaki UV inks, but it can also be used for solvent and latex printing. For information, visit www.mimakiusa.com. PERFORATED WINDOW FILM Contra Vision, Atlanta, hopes to revolutionize the window film market with the launch of Contra Vision HD Performance. This break-through micro- perforated window film delivers bigger and better image impact and a much smoother see-through view than any perforated film available. One-way vision window films that look like solid graphics have wide-ranging applications says Contra Vision. For information, visit www. contravision.com. NEW COLORS FOR CONFORM CHROME FILMS Avery Dennison Graphics Solu- tions, Mentor, Ohio, launches of three new colors, a new finish and a larger width for the Conform Chrome Series of vehicle wrapping film. The new vinyl films, intended for accent wraps, are available in 53" width, and they include Violet, Rose Gold and Matte Silver. Similar to previous Conform Chrome films, these new colors can be applied to simple curves, and they feature patented Easy Apply RS adhesive. Conform Chrome Matte Silver is the first film from the series to feature a matte finish, and it is recommended for full wrap applications as well as accent wraps with mirror-like finishes for an authentic chrome look. For information, visit graphics.averydennison.com. CONFORMABLE CAST VINYL FLEXcon Company, Inc., Spencer, Massachusetts, introduces FLEX- con DPM Cast White Opaque Sheet (CWOS) and Cast White Sheet (CWS) for heavy equipment labeling, permanent outdoor signage applications and more. These 2.0 mil highly-conformable cast vinyls are coated with a high- performance, aggressive permanent adhesive (V-344). This industry-proven and recognized adhesive provides a permanent bond to plastics and metals, as well as moderately rough surfaces. The 90 lb. moisture stable release liner facilitates efficient converting and handling. For information, visit www.flexcon.com. OVERLAMINATE Mactac, Stow, Ohio, introduces improved PER- MACOLOR ColorGard LUV overlaminates. With a new 3.2-mil clear PVC facestock that is known for its ability to eliminate color shifting and a 58# smooth white Kraft liner, Mactac's ColorGard LUV family of high-performance acrylic pressure-sensitive adhesive films are preferred by distributors, graphic designers and end-users alike. ColorGard LUV films are available in a variety of surface finishes, including the LUV8000 Gloss Series, LUV8100 Matte Series and LUV8200 Lustre Series. For information, visit www. mactac.com/graphics. HIGH-PERFORMANCE CALENDARED FILMS Advanced Greig Laminators (AGL) Deforest, Wiscon- sin, introduces AGL's high performance line of calen- dared adhesive backed vinyl media and match-com- ponent high performance calendared over-laminate films developed for medium-term applications. AGL's Print-Smart HPV5 is a high quality polymeric vinyl media for short- to medium- term permanent applications. Print-Smart HPV5 is a high-performance air-egress vinyl for most sign applications. 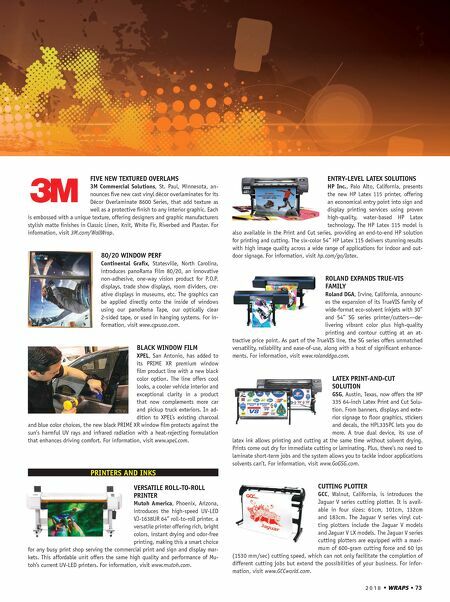 This media is designed for solvent, eco-solvent, latex and UV-cure inkjet printing on wide-format printing systems. For informa- tion, visit www.aglinc.com. EMBOSSED PRINTABLE FLOOR FILM Drytac, Richmond, Virginia, introduces SpotOn Floor 200, a new film for floor advertising graph- ics. The latest introduction to Drytac's product line is 8mm (200µ) embossed printable white matte monomeric PVC film for short-term, indoor floor graphics applications. Thanks to a unique dot pat- tern printed pressure-sensitive polyacrylate adhesive, the new film can be ap- plied to multiple flooring surfaces including floor or ceramic tiles, sealed wood or concrete, waxed vinyl, marble, terrazzo surfaces, and more. It also boasts a post-printed anti-slip rating of R10 (according to DIN 51130:2010) which allows for vibrant, slip-resistant floor graphics without the need for over-lamination. For further information on Drytac and its leading range of films and adhesives, please visit www.drytac.com. NEW FAMILY OF WRAP FILMS ORAFOL Americas, Black Creek, Georgia, introduces the 970RA family of films. Not only does it feature the quality and durability you desire, but also one of the widest selections of solid color wrapping films available on the market today. Now available in 121 vibrant, gloss, matte, metallic and shift-effect colors; there is a color and finish for every customer. All ORACAL 970RA wrapping films are ready to use straight out of the box and have the attributes you've come to love; paint-like finish, amazing conformability, and engineered with RapidAir technology, which reduces the incidence of bubbles and makes installation a breeze. Best of all, there is no lamination required due to the built-in clear coat top layer. For information, visit www.orafolamericas.com.